A note to oncology care providers…. A few months ago my staff and I experienced multiple losses in a short period of time of patients we were very close with. This is a note I wrote to them to remind them that while our job is not easy, it is so worth it. To all oncology care providers out there, remember you are making a difference. Recently I sat down at my new church to learn more about the church and in return, they wanted to learn about me. 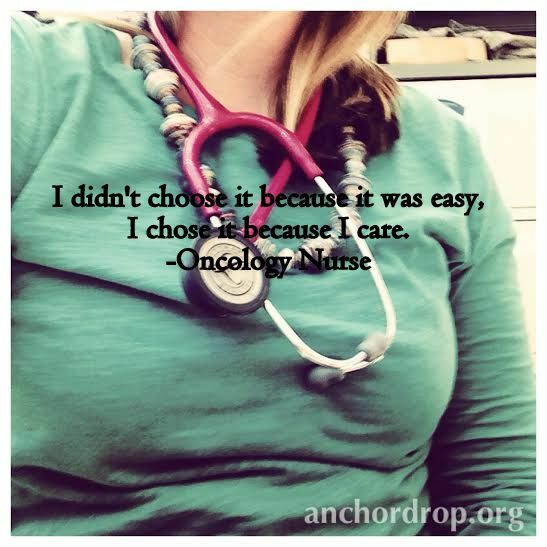 Quickly into my career as an oncology nurse I learned to just say “I’m a nurse” leaving out the oncology/cancer/hospice part. The reason for this is because once you say the word “oncology” or “cancer” and especially “hospice”, people’s faces tend to fall and the next question is often “how do you do it?”. In this particular case I did say just nurse first, but they proceeded to ask the question of what type of nurse, so I answered. Then I heard countless stories of how other people in the field of oncology had touched them and their family through cancer battles. Each of you are a part of this team who makes a difference day in and day out in the lives of these patients and their loved ones. You hold their hands when they are scared, you clean up their puke, empty out their urinals, help them to the bathroom when they are too weak to make it on their own, but they want the dignity of going in a real toilet, you educate them on safety and why you need to be there, and the list goes on. Each of us got on this career path for different reasons and each of us will be here a different amount of time. For some, it is a brief stop in their career journey. For others it will be their life’s work. Others it is somewhere in the middle. Some people landed here because you yourself or a loved one was personally touched by the care other healthcare providers in the oncology field provided. There are those that just landed in this because it was the open position. And others have a heart for oncology just because. No matter the time frame or reason, you matter. So as I reflect back on the losses that we all felt deeply this week. As I think of the countless times I’ve felt the grief of losing an incredible patient to the horrible disease that is cancer, I want to encourage each of you. I want to let you know that you aren’t alone. I want to let you know that there is room to grieve. Most importantly though, I want you to know that you matter. That the work you are doing day in and day out is changing the lives of people, many of who have a ticking clock over their heads on how long they have left on this earth. 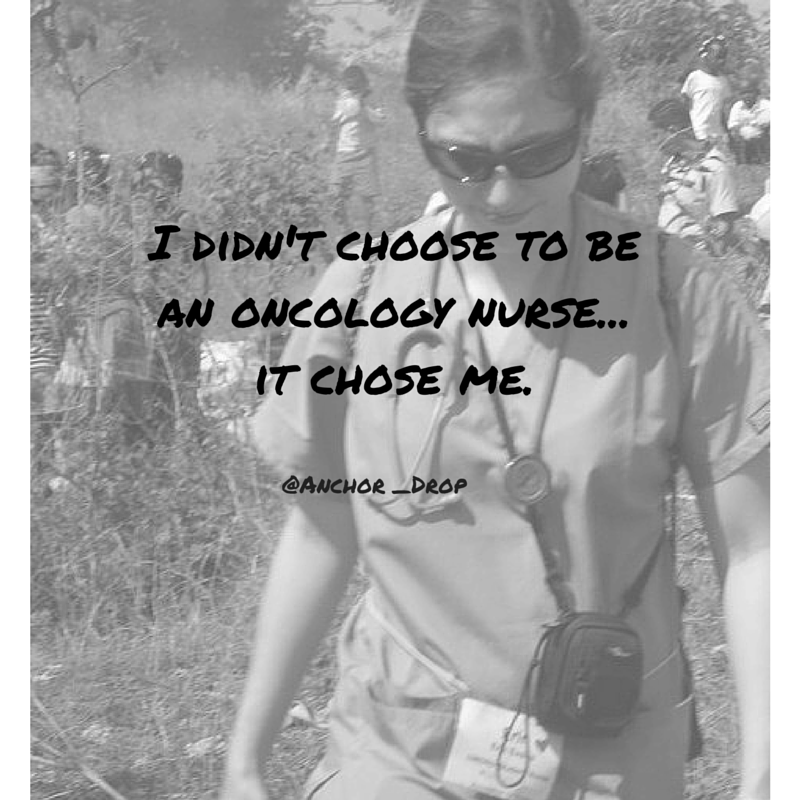 Oncology nursing has been my career plan since I was 16, but nursing leadership/management was not in that plan, that is more something that transpired as my career has progressed. As a leader on this unit, I am honored to work alongside each of you. You all and the patients are the reason I am here. And every time I hear “exceptional plus” or “satisfactory plus” in response to the care you are providing, my heart swells with joy and pride. Thank you for being a team that listens and truly cares. Thank you for caring, even when the pain runs deep. Please know my door is always open for a place to debrief and I’m walking alongside each of you. Thank you for making this unit exceptional plus. How do you do it? It’s a question I get asked all the time about my job. Some days, on days like today, where I mourn the loss of a patient who was near and dear to my heart, I wonder. I wonder how do I continue to do this? But here’s the thing, even when my heart is laced in grief my response is this – how could I not do it? You see, the deeper I dig into the question, the longer I’m an oncology nurse, the older I get – the more aware I become of how things in life aren’t necessarily meant to be easy. Especially the best things in life. I still remember when I was 17 walking into a hospital and my thought was “this feels like home”. Sounds crazy, right? But there was something that drew me in, and continues to draw me in. The more I thought about and experienced the oncology field, the more I was hooked. I can’t explain it, and I’m not sure that any one of us can. This is what I do know though – you ask any of us who feel called to the oncology field and we can simply answer “I was made to do this”. So instead of looking for ways for it to be easier, I’m looking for ways to walk through it well. So as I have thought through and continue to think through the question “how do you do it?” I still keep coming back to, how could I not? I mean, I could not. I could walk away and enter another field of nursing and some day I might. But as for now, this is my calling, and I know this with my whole heart. So instead of looking for ways for it to be easier, I’m looking for ways to walk through it well. I’m making a conscious decision to every day develop who I am and my coping mechanisms. I’m choosing to surround myself with community that will walk through life with me. I’m digging into who I am, how I was created, and working on making myself the healthiest I can possibly be. Most importantly though, I’m choosing to focus on the things that make me love my job. I mean, for a science nerd, to be in one of the fastest advancing medical fields is incredible. The amount of new drugs coming out is breathtakingly awesome. Not to mention I work with some of the best doctors, nurses. CNAs, midlevels, and other office staff around. They are like family to me. I wish that just for a moment you could get a glimpse into the incredible people’s souls who entrust me to walk with them through the hell they are living in. The best part though? The patients and their loved ones. The fact that because of my job, I have met some of the most amazing people is enough, but it doesn’t stop there. I wish that just for a moment you could get a glimpse into the incredible people’s souls who entrust me to walk with them through the hell they are living in. I have witnessed what true love looks like in all sorts of relationships. It’s in the husband who still finds his wife beautiful, even when all her worldly beauty is gone. It’s in the son who makes his work schedule around when his mom has chemo treatments. It’s in the friend who cancels her plans on spare of the moment to take their very sick friend to treatment. It’s in the adult kids who take care of their dying father in his final days so he can be at home. These people, the patients and their loved ones, challenge me to be a better person. To love deeper. To live well. To embrace all emotions – both the good and the bad. To be the best me I can be. So instead of asking me “how do you do it?” Ask me “how can I help you do this?” Because that is what we need. Any of us in fields that are as emotionally tough as the oncology field need the cheerleaders on our side. Walking with us, crying with us, listening to us. This is the best thing you can do for us, so that we can continue to do what we were made to do, and do it well. It was not until this statement was spoken into my life that I realized how frustrated I was as an artist and a young professional. I was stunned and grateful. There’s a reason you’re at where you are at. But don’t just give up so easily, you know? I think people get into a job and they say if this job isn’t what I want, well I can do better. Sometimes you do need new employment, but I think a lot of times it’s us missing open opportunities. I once knew a guy that worked with me at X-games. He was a higher up…but guess what? He started as a janitor! If he had said, “ahh screw this” he would have never been where he is now! (sigh) Hang in there! So I suppose that is really what I’m trying to say is Inspiration helps move the “I’m stuck” notion. It keeps the momentum moving slowly until the momentum starts to pick up again. When I realized I was under appreciating my job roles – that a lack of acknowledgment of their lessons and values was holding me back – my perspective began to shift. I had to “take myself out of it” for a minute to “get it.” Does that make sense? I needed to remove myself from my situation and look at it critically to see that I was the one causing my pain. When I started assessing what I needed to feel satisfied in a career, I saw one missing piece. It was a big piece – one that led to my lack of fulfillment. Here it is: I was in a creative role without actually being creative in any way! How is that possible? A creative without a canvas is like a chef without food – it simply cannot be. That is what sparked a new take on inspiration. I learned why inspiration matters. I have to be thankful for experience in cosmetology school and the lessons I learned there. I worked with clients on a daily basis, drudging along doing the same ole task (sort of…) – it can be really hard for someone who wants to be the go-to girl! It was the clients who gave me the inspiration to want to achieve more. The clients who show up regularly with their fires and rush requests – there insistent energy. The clients that kept me employed and keep a roof over my head. They inspired me be the best I could be and never to give up. I am forever thankful for that inspiration, as it has become the momentum behind my professional drive. Love her or hate her, Taylor Swift is one of the classiest women in the entertainment business today. I heard that she finds inspiration in her fans. Recently, she noticed that one follower in particular, whom she usually finds very inspiring, was not doing well. She was down about her unpaid student loans so Taylor responded in a big way:”she painted her a picture, sent her some gifts, and shocked her with a check for $1,989 (the title of her album, how clever!) for her student loans. In general, she supported her. You see? Inspiration matters. Inspiration and creating inspiration for others matters! It affects how you view your job. It affects how you interact with your customers and clients. 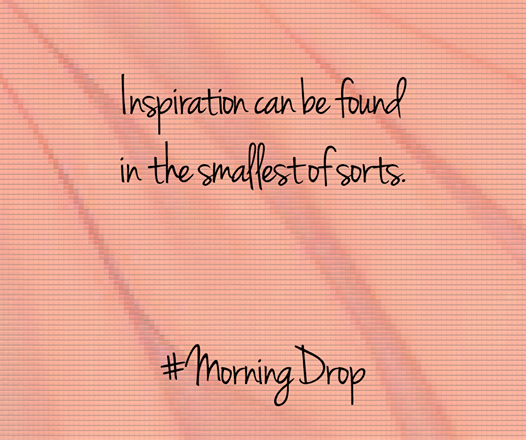 Inspiration is what gives you a jump-start and builds momentum when it seems to be moving slowly. When our career comes to a slow part, when we question every ounce of why we originally chose the direction we did, when we feel puny and small and that we simply Do. Not. Matter. That is when we must open our eyes, dig deep and find the inspiration to keep going. Keep pushing and driving for success. You can do it, I know you can!